A new spin on the classic Clement C. Moore's poem, taking a look at Christmas under the sea! This hard back book with glittery letters, takes you on an adventure with marine life. Using the temp of the original poem, Ms. Kelleher uses all under the sea items to retell the story. "The seashells are hung on the coral with love. ", "Up to the porthole I swam like a shark", "Now swim away, swim away, swim away all!" Using great marine creatures, both real and imagined such as mermaids, oyster beds, sea foam, jellyfish, dolphins, sand dollars and more. Santa looks very much like a walrus and travels in a conch shell sleigh. Very creative!! The rhythm and rhyme of the story flows wonderfully and introduces kids to new words under the ocean. Beautiful illustrations by Dan Andreasen, illustrator of over 20 picture books. 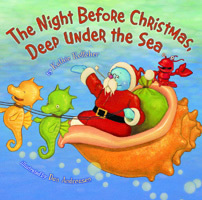 This picture book is sure to delight young children ages 4-8, and give a unique look at Christmas from the perspective of a lobster! I received a copy of this book from Holiday House. You can visit Holiday House here to purchase your own copy this Christmas season!